While I was researching yesterday's post on The Divorcee, I found a terrific online resource for architectural artifacts: Urban Remains in Chicago. I ended up spending a lot of time going through their Art Deco period inventory which includes the 1930s startled cat door stop at top. 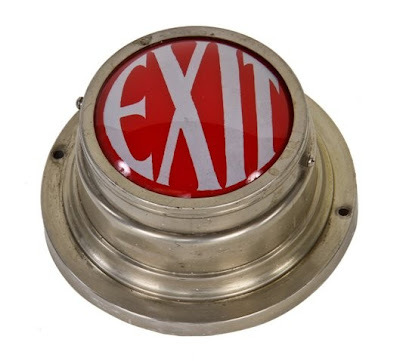 I'm crazy for authentic Art Deco interiors, but I also know that there is a lot of Deco drivel out there. Deco flourishes can quickly careen into tacky territory. My advice would be that unless you live a Deco era home, go light on the Deco furniture and accessories. The pieces below are ones that I think would look great mixed in with other periods and styles. 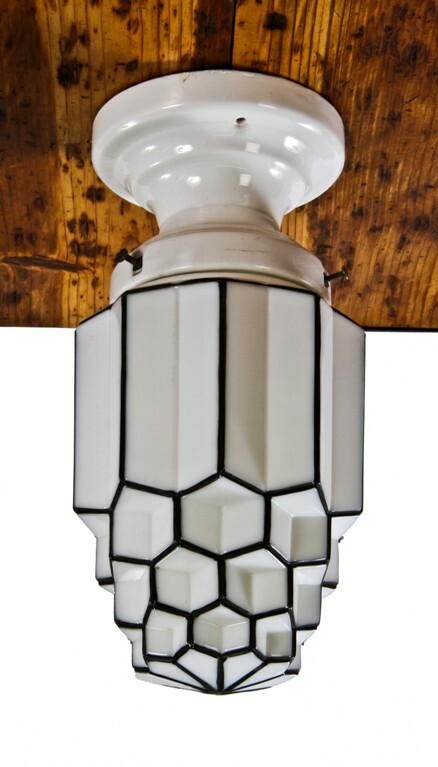 A 1920s pendant light with baked black enameled accent. 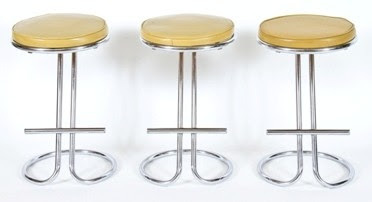 These 1930s era metal stools are probably too short to be used at a kitchen island or a bar, but could be use for pull up seating around a table of some sort. 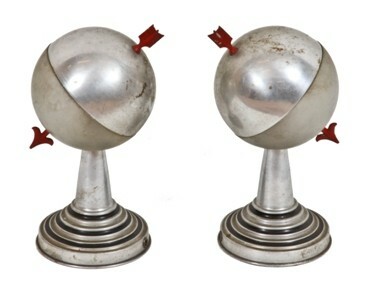 A novel pair of armillary table lamps, c. 1930s. 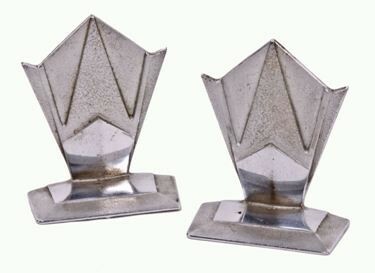 A pair of 1920s chrome plated, cast iron bookends. I like the looks of this light, although you would really have to find the right space for it. I like the shape of this mantel, although the varnished oak I'm not so crazy about. 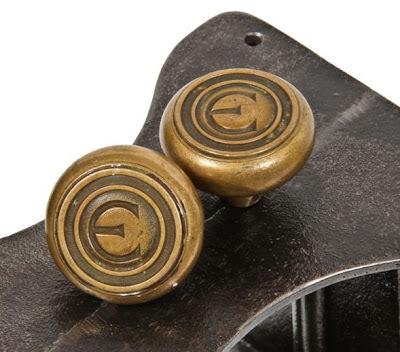 If your first or last name begins with an "E", these door knobs might look nice in your dressing room, powder room, coat closet, etc. The trick to getting Deco right is to go to the source, FRENCH Deco. The French created it and even at the lower end of the market, the French got it right and did not devolve into kitsch like the lower end of the American, mass-produced items. Molded glass pendent lights, suspended from three or four chains(coupes) by the great French glass manufacturers like Verlys, Sabino, Mueller Freres, Lalique, etc. are sublime and fit into any decor and are still reasonably priced. Try E-Bay France to find some and then have them wired.rewired for the American voltage at a local antique wiring shop. 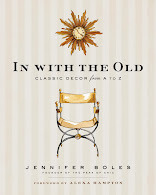 Great advise regarding art deco decorating. I've been restoring the original interior intent of our mid-30's French art deco home and have found that fine line between quality simplicity and tackiness. My mission mottoe: Find the best quality pieces you can afford w/ great lines and highlight it w/ keeping it simple. Quatorze, you obviously know much more about Deco than I! That's a great idea to consult Ebay France. 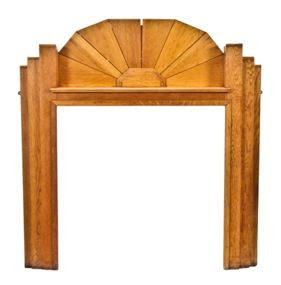 I agree with Quatorze, but that mantel is to die for--the surface just needs a little hard paste wax. Great post. Thanks for the introduction, the place is fabulous! Agreed, everything in the right dosage, and most importantly everything of quality. It is always so thrilling to discover a new source of well edited vintage items dahhling. Urban Remains is only half a block west of our shop and you're right, Eric has some great Art Deco pieces. Most of them, of course, are out of my range--like the pair of nickel-plated grilles from the demolished Diana Court building on Michigan Avenue--but he sells to clients all over the world, so it's not like he needs my business, anyway. I console myself with the reminder that I no longer live in my former Streamline Moderne apartment building, where such pieces looked their best. Not that I ever had pieces as nice as Eric's. A few Kem Weber chairs & tables was all I could afford--and even they came from Goodwill. Ah, the good old days. The biggest temptation for collectors of Art Deco or Arts & Crafts pieces--serious collectors, unlike myself, that is--is to show off everything at once. 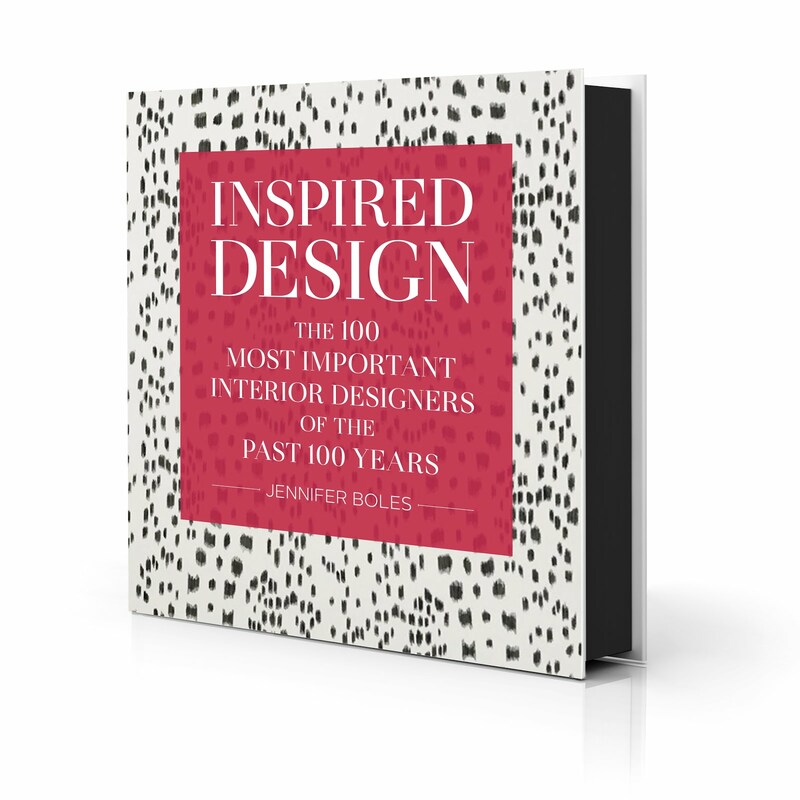 Instead of a single Steuben crystal vase on a black glass table, or a Wheeler Williams statue in a niche in a plain-colored wall, there will be a whole etagere full of iconic pieces in various sub-styles, all fighting for attention & canceling each other out. Mies, as usual, was right: Less is more. I remember the first time I saw Robert Stern's installation of a collection of restored plastic radios in a new area at the Rainbow Room in NYC, and as handsome as the installation was, and as pretty as the radios were individually, the re-imagined rooms had none of the slick, stark glamour of the original spaces, where there wasn't a single thing that didn't have to be there. I love the items you featured here. It has lots of humor. The designs are so interesting. just wanted to say I have been enjoying your blog! 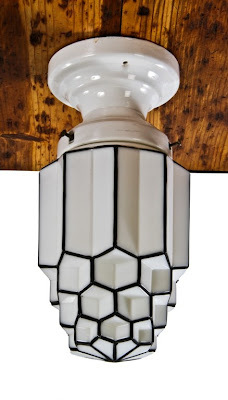 I used to have this 1920s lamp (black baked) in my childhood home. It recently broke and I would love to replace it. Where did you find it? 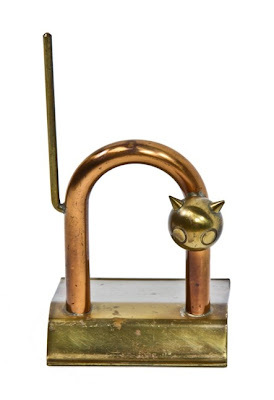 Hello there - I just purchased this same doorstop at a thrift store but it does not have the tail. Do you have any idea of its value without the tail? Any help would be much appreciated - Thanks! !